This morning, GRAMMY® Award winners Cage The Elephant confirm three opening dates on The Rolling Stones’ sold-out “No Filter” European tour. 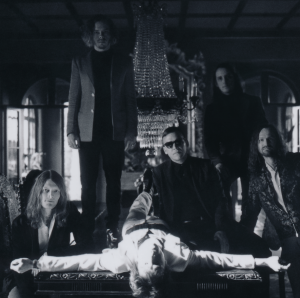 Cage The Elephant will perform as the support act on the final three nights of the English band’s 14-date arena tour, October 19th, 22nd, and 25th, in the brand-new Paris venue, the U Arena. Additionally, Cage The Elephant is performing two headlining dates in Paris, at L’Alhambra on Wednesday, October 18th and Le Trabendo on Tuesday October 24th. The latter date, October 24th, will be an intimate “Unpeeled” performance featuring the band in a stripped-down arrangement, with a string quartet accompaniment. Tickets for these dates are on sale now and can be purchased here. On Sunday, September 24, Cage The Elephant will perform at UVA’s Scott Stadium in Charlottesville as part of “A Concert for Charlottesville,” an evening of music and unity in response to the recent events in Charlottesville. The concert will be hosted by the Dave Matthews Band and will feature performances by them and Cage The Elephant, Pharrell Williams, Justin Timberlake, Chris Stapleton, Ariana Grande, Brittany Howard of Alabama Shakes, The Roots and special guests. Tickets to this event are free, and attendees are encouraged to make a donation to the “Concert for Charlottesville Fund” at the Charlottesville Area Community Foundation. Beneficiaries of the fund will include victims of the events in Charlottesville on August 11 and 12, and their families, first responders, and organizations devoted to the promotion of healing, unity and justice locally and nationwide. Donations can be made here. This Friday, Cage The Elephant will also perform at St. Louis’ Loufest. The band have played a string of highly celebrated festival dates throughout the summer, including their much-lauded set at Lollapalooza, which Consequence of Sound called a “landmark set,” the Chicago Tribune hailed as “damn good rock n’ roll,” and which led American Songwriter to name the band “worthy of headliner status.” Cage The Elephant has a number of remaining festival dates in the U.S., including Life is Beautiful Fest, Ten Sixty Five Street Party 2017, Mempho Fest and Cal Jam with The Foo Fighters and Queens of the Stone Age. Tickets for these dates are on-sale now and available here. 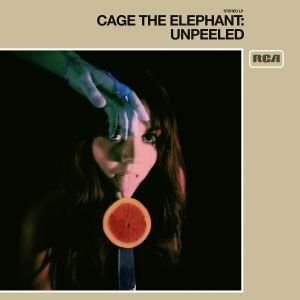 Cage The Elephant’s latest album, UNPEELED, which Billboard says, “…literally peels back those layers to expose something more raw, and ultimately more beautiful,” is out now on RCA Records, and you can listen to it here. To commemorate the release of the album, Cage The Elephant rolled out 21 live performance videos worldwide, one for each song on UNPEELED. You can find all premieres here and watch all of the “Unpeeled” videos here. You can’t talk about music in this century without mentioning Cage the Elephant. They are the last of the great bands — or perhaps, based on new album Unpeeled, the first of the great new ones. They trace their nervy, seditious lineage from that same uncompromising place that gave us Between the Buttons-era Stones, the Pixies, the Stone Roses, the Velvet Underground and Iggy Pop. In fact, it was as if Bowling Green, Kentucky’s second-most famous export had been born full-blown and knowing when they first burst out on a stage in the early days of 2006, regurgitated whole out of the music’s murky past with their platinum hair, sunglasses and Doc Martens. Mysterious, a little troubled, with an unstudied cool, a reckless charm and the striking looks of the young Yardbirds and the rakish confidence of the early Stones. That might have been the most important lesson the band learned working with Dan Auerbach, who produced Cage’s 2015 Grammy-winning Tell Me I’m Pretty album. He helped them chip away at all the things that stood between them and their songs, uncovering their own raw power. “The biggest thing we’ve done in the past few years is to rein in the need to heap every idea we have onto a song,” explains Brad. Which meant a radical jettisoning of conventional notions of what a band should be. Cage lost all the posing, the affectations, the overweening affection for ‘80s and ‘90s punk, the desire to be anyone else except who they were, stripping everything down to bare-bones essentials: strong, uncomplicated songwriting; an understated yet wicked intelligence; lyrical eccentricity; a brutish rhythmic center; and the kind of abandon that propels Matt headlong into a writhing crowd often. Why? Because he is Cage’s audience, a tilted mirror for all the fans concerned with the same things Cage the Elephant sing about. Questions of self-doubt, creative dissatisfaction, isolation, identity, uncertain love and an even more uncertain future. “When I look over the crowd every single night, I start to remember that we’re so intimately connected to our audience. I tend to write songs about pretty heavy things, and when I see these kids out there singing them as if they’d written them themselves, I realized the songs resonate with them because they’ve had very similar experiences, and they identify with us,” says Matt. After Cage the Elephant performed at Neil Young’s 2016 Bridge Show Benefit, they gained a new appreciation the songs they’ve been writing and performing for the past 11 years. They took that idea to nine cities, where they played acoustically on what they called Live & Unpeeled tour, recording the shows in cities including Los Angeles, Washington, Knoxville and Nashville, ending up with 18 songs from the band’s past four albums as well as three retooled existing songs, performed live and stripped down — in some cases with a string quartet and small choir. “It was really all about the balance of the intimacy and the delicacy of how we approach playing these songs live acoustically and with strings,” says Brad Shultz “We found the more honest we could be with ourselves, the more honest we could be with everyone else. “I think with the bigger shows you’re exchanging energy with the crowd and losing yourself in the moment, overwhelmed with all the energy. 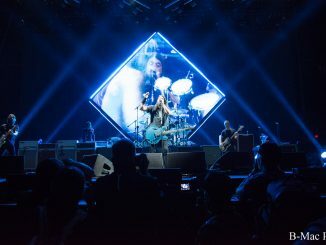 Playing this way, you find yourself more overwhelmed with the songs, and it’s more like you’re finding yourself in the moment,” continues Brad. So overwhelmed that the band decided to turn those shows into an album. “I always wanted to make a record that captured what was happening in the moment,” says Matt. “There are many times in the studio where you don’t necessarily capture a song exactly the way that you’d envisioned it. So this was an opportunity for us to go back to some of these songs and not necessarily rerecord them and totally reimagine them, but add some things that maybe we would have, had we had the time and resources in the past. Many times you’re adding sonic layers looking for something to hide behind, and what you don’t realize is that that vulnerability and that nakedness might be the most compelling and interesting thing about the song. Kinda like people who like to watch any kind of sporting event: everyone knows that accidents are more far more interesting than someone doing something perfect. “I’m really excited about the future,” Matt continues. “I think everyone in our group is going through a hyper-growth period in life, absorbing a lot. And a lot of the fear that held us back is starting to be lifted. The band took the inspiration for the new album’s title from the Velvet Underground’s first album. 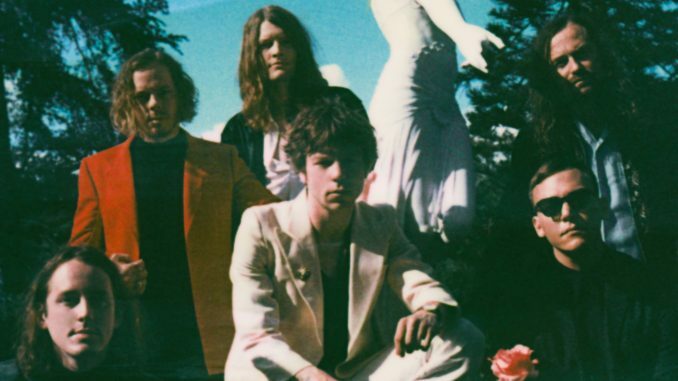 Cage the Elephant’s purity of purpose and impulse to communicate what can only be felt beat as steadily in their hearts as they did for the Velvet Underground on the gritty streets of New York in the mid-1960s. “I definitely believe that music is spiritual, and I think that its most interesting characteristic is in its ability to express what’s unseen. To tell the truth, I believe in the power of honesty, no matter how uncomfortable it might be. It’s a universal strength that overpowers just about anything. Truth always comes out; it just depends on how long it takes,” says Matt.